Lightning strikes: What causes lightning is a mystery. Could it be cosmic rays? Lightning strikes over San Pietro mountain, in the French Mediterranean island of Corsica. Could lightning be triggered by cosmic rays? The main problem is that we don’t know how a thundercloud gets the spark needed to initiate a lightning bolt. The biggest mystery is that the electric field in thunderclouds is not very large. Years of experimental measurements from aeroplanes and air balloons have shown that the field is about 10 times smaller than what is needed to initiate lightning. It is not clear how a lightning bolt is born, but the idea is that something has to “seed” it first. In 1749 Benjamin Franklin discovered that lightning was an electrical discharge between a thundercloud and Earth. 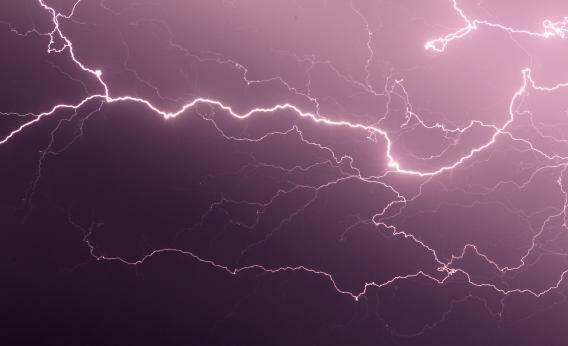 We know that thunderstorms can generate over 100 million volts of electricity, but we also know that this gets applied across a really large space—hundreds of metres. So the resulting electric field, or concentration of electric force, is not actually very big. It is estimated that Earth gets struck by more than 100 lightning bolts every second. How is that electric current released? For lightning to propagate from its point of origin to other locations—the ground, for example—the air, which is normally an insulator, must somehow permit electrical charge to move freely. The lower part of a thundercloud is negatively charged, and as a storm moves, it causes positively charged particles to gather at ground level. So, as the lightning is triggered, the lower part of the cloud generates a channel of ionized air—or lightning “leader”—that allows electric current to flow freely and transports the negative charge towards positively charged objects, such as trees or buildings. That is when a lightning strike happens. And these currents are huge: They heat the air to about 27,700 degrees Celsius, roughly four times hotter than the surface of the sun. A hypothesis explored by many scientists is that lightning is initiated when collisions between ice particles in thunderclouds ionize the air. The ice particles can separate enough electric charge to cause a large electric field and trigger a lightning strike. Another possibility, which I am working on, is what is known as “electron runaway breakdown”. The idea is that there could be another type of electric discharge, a completely new physical phenomenon. Cosmic rays are high-energy particles, mostly protons, born in and accelerated by energetic astrophysical processes, such as supernovae and star collisions. These rays travel across space and strike the upper atmosphere of Earth, producing highly energetic showers of ionized particles, accelerated nearly to the speed of light. We can measure these ionized particles with cosmic ray detectors. Because cosmic rays produce highly energetic showers, for them to trigger lightning in a storm cloud, the cloud’s initial electric field does not have to be very big. Our theory is that when these high-energy particles happen to go through a thundercloud, they ionize the air inside it and create a region with a lot of free electrons, which collide with atoms in the air and produce even more electrons: that is a runaway breakdown. In this case, the initial distribution of electricity in the storm cloud can be across a vast amount of space—several hundred meters or even kilometers. That is because once runaway breakdown is triggered, the cascade of high-energy particles quickly covers large distances. The result is the creation of this very large amount of negatively charged particles, exactly what is supposed to trigger the spark that initiates a lightning bolt. In principle, this is what is happening in thunderclouds, but nobody has yet proved it directly in experiments. The results of numerical calculations have demonstrated that this runaway electron breakdown exists. But the theory is always related to some idealized model. In a real thunderstorm, conditions such as wind and electric field vary in space and time; it is incredibly difficult to prove the hypothesis experimentally. So we decided to take a look at radio pulses that are produced at the inception of a lightning strike. These have been noticed before, coinciding with cosmic rays but never explained. We wanted to prove that it is the showers of ionized particles caused by cosmic rays penetrating thunderclouds that produce the radio pulses. We used a device that measures radio waves and shows which direction they come from, to record data from 3,800 cloud-to-ground lightning strikes in Russia and Kazakhstan. When we analysed this data we found that, although their pattern matched that predicted by the models of runaway breakdown, the pulses were too big to be produced by regular cosmic rays. We suggested an explanation: we know that every storm cloud has tiny charged ice particles called hydrometeors, and we think they might be amplifying the pulses. Our calculations confirm it: when a large amount of free electrons – created in a runaway breakdown process initiated by cosmic rays—collect near these hydrometeors, they boost the current and observed radio pulse signal. We are also trying to find a correlation between gamma rays, cosmic rays and radio pulses, because we believe the gamma ray bursts we see above storm clouds are caused by the runaway breakdown process. Gamma rays are essentially an extremely energetic form of electromagnetic radiation. They are usually invisible, but highly energetic explosions of gamma rays, known as gamma ray bursts, are visible and incredibly bright. These bursts usually occur in deep space, but they are also observed in Earth’s atmosphere as very bright flashes lasting a fraction of a second above powerful thunderclouds. In my opinion, runaway breakdown could happen in gas, it could happen in space, and that’s what we’re searching for. Analogous processes could take place on the surface of Jupiter, for example. So understanding runaway breakdown here on Earth can help us understand what happens elsewhere in the universe.